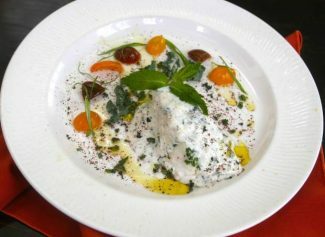 This halibut and tzatziki recipe is one of my Lebanese favorites. Halibut is coming into season and sharing a bit of home with others is always a joy for me. Remember this rule when cooking fish or seafood: If it smells fresh, it is; and if it smells fishy, it isn’t. Go with what smells fresh. Know, too, sumac is a spice dating back to the Ottoman Empire and is widely used in the Middle East. I have yet to find a local retailer for sumac, but it can be purchased online at http://www.kalustyans.com. I also prefer to use Maldonado sea salt, available at local grocery stores. Serve with a spicy Pinot Grigio or an earthy wheat beer, available from any of our great local purveyors. Brush each halibut fillet with a touch of finely chopped garlic, and season with sea salt and a couple of twists of freshly ground pepper. Pour about 1/8-inch olive oil into two separate skillets and warm over medium-high heat. When oil begins to dance, gently place two halibut fillets in each skillet, searing two minutes on each side, beginning with the seasoned side down. You want the halibut to be firm to the touch. Then, add the white wine and lemon juice, splitting equally between the skillets. Remove skillets from the stove top and immediately place in a 350 degree, preheated oven for another 12 to 15 minutes to finish cooking. While the halibut is finishing in the oven, it is time to make the tzatziki. In a separate bowl, thoroughly combine tahini, cucumbers and mint. Once mixed, slowly and carefully fold in the drained Mediterranean yogurt. “Slowly and carefully” is key to avoid the tzatziki becoming watery. Set aside until served. Once halibut is done, remove from the oven and plate. Place a generous dollop of tzatziki in the center of each fillet and garnish with a light sprinkle of sumac. Basmati rice cooked with a touch of cinnamon and garlic makes a wonderful side, as does a nice tomato salad with fresh mint, lemon juice, garlic, olive oil and salt and pepper to taste. Serve with a spicy Pinot Grigio or an earthy wheat beer, available from any of our great local purveyors.